The first transcontinental railroad, built between 1864 and 1869, was the greatest construction project of its era. It involved building a line from Omaha, Nebraska, to Sacramento, California, across a vast, largely unmapped territory. To most Americans the West was as remote as the moon, its terrain as alien and forbidding. Like the moon project of a later generation, its conquest required immense resources. Unlike the moon project, the building of the railroad was undertaken by private interests, but only after Congress passed legislation to help finance the work. The term “transcontinental railroad” is misleading in that the United States has never had a railroad under one ownership that connected the Atlantic Coast to the Pacific. The first transcontinental railroad, and those that followed, spanned that part of the continent from the Missouri River to the Pacific Coast. Even that distance overwhelmed the resources of any single group of investors. Not one but two companies undertook the task. The Union Pacific built westward from Omaha and the Central Pacific eastward from Sacramento to a meeting point in Utah. The leaders of both companies lobbied incessantly for government aid. Their efforts led to the Pacific Railroad Acts of 1862 and 1864, which provided several forms of assistance. Each railroad received its right-of-way along with a land grant of ten alternating sections on both sides of every mile of track (about 12,800 acres per mile); the government retained the sections in between. In addition, the companies received government bonds totaling $16,000 a mile for each twenty-mile section of track completed on the plains. For the plateau between the Rocky and Sierra Nevada Mountains the amount per mile went up to $32,000 per mile and for the mountain regions, $48,000. Each company could also issue its own first mortgage bonds for the same amount as the government bonds, relegating the latter to a second mortgage. These provisions sound more generous than they were. The land grant ultimately proved valuable to both railroads but played only a minor role in financing their construction. The land was difficult to sell, in large part because it had first to be surveyed, and the overwhelmed government land office issued patents (titles) to parcels at a glacial pace. In the end the land grant helped underwrite Union Pacific construction mostly as collateral for yet another class of securities known as land-grant bonds. The government bonds have often been described as a subsidy or handout to the builders of both railroads, but they were in fact a loan that ultimately had to be repaid. Each company was, of course, responsible for paying interest on its own bonds. The leadership of the two companies differed strikingly. The Central Pacific was dominated by the so-called “Big Four”: Collis P. Huntington, Mark Hopkins, Leland Stanford, and Charles Crocker. Although they bickered constantly over policy and had an occasional falling out, they were tough-minded men who drove the project steadily forward despite their differences. Huntington, based in New York, handled the difficult tasks of raising capital, forwarding needed supplies, and putting out political fires in Washington DC. Crocker took charge of the actual construction; Hopkins took care of accounts in California, among other duties; and Stanford did a little bit of everything, not always to his partners’ liking. The Union Pacific lacked strong leadership except for the engineer in charge of field operations, General Grenville M. Dodge. The corporate officers above him were based in Boston and New York and split into factions that spent as much time and energy scheming against each other as looking after the railroad’s construction. At first the flamboyant Thomas C. Durant dominated the management, but after a lengthy struggle he gave way to Oliver and Oakes Ames, leaders of the Boston group. Oakes might have managed well but was preoccupied with his role as a congressman. Oliver was well meaning but a bookkeeper at heart with no taste for conflict. A coterie of other strong-willed directors ensured that little would get done without a fight. The leaders of both companies understood one guiding principle clearly: an unbuilt railroad through unsettled country would not do a profitable business for months, even years, after its completion. Money could be made on the venture not from the railroad itself but from its construction. To do the work, therefore, both groups formed separate construction companies and dominated the management of them as well as the railroad. Under this arrangement, at a time when conflict of interest was still a primitive concept, they in effect made contracts with themselves, taking care to build in generous profits for the construction companies at the expense of the railroad. The Big Four chose the prosaic name of “Contract and Finance Company” for its construction entity. By contrast Durant and an associate unwisely picked an exotic French name for their company, calling it the “Crédit Mobilier of America.” Years later, when newspaper charges of scandal and bribery in the construction work blew up into a congressional investigation, Crédit Mobilier became a symbol for corruption and malfeasance. Durant had ignored more homespun names in favor of one that smacked of foreign exotica to which any suspicion of fraud or villainy could be attached. In most cases, a contract for construction of a given amount of mileage would be made between the railroad and some individual, who then assigned it to the construction company. Payment for completed sections of track went to the railroad, which used the funds to pay its bills to the contractors. On the Central Pacific this process went smoothly in most cases, while on the Union Pacific nearly every step floundered in controversy. Some individuals had the railroad as their primary investment, while others had Crédit Mobilier. The former took a keen interest in keeping construction costs down, the latter in padding them wherever possible. Some directors also had private interests of their own that did not fit neatly within either group. No reliable figures exist for how much construction of the line cost. One estimate places the cost of the Central Pacific at about $36 million, another at $51.5 million. Oakes Ames testified that the Union Pacific cost about $60 million to build. 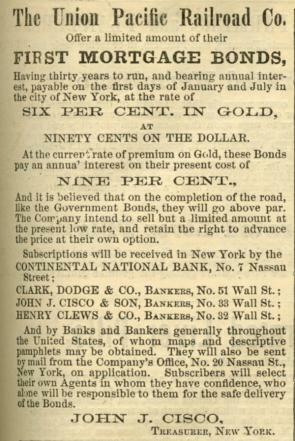 When the road was completed in 1869, the capitalization of the Union Pacific stood at a staggering $111 million, of which $74 million was in bonds. When the Crédit Mobilier scandal exploded in 1872–1873, both the House and Senate formed committees to investigate the charges of fraud and bribery. Their findings succeeded only in making a tangled tale even more convoluted. Oakes Ames was pronounced guilty of bribing fellow congressmen, but no one was found guilty of receiving the payoffs. Although numerous figures were tossed about in testimony then and later, the actual cost of construction remains unknown. The government bonds received for construction—the so-called subsidy—remained a bone of contention for another quarter century. Ultimately both railroads paid off their government debt in full. From the first, the government also received another payment in the form of reduced rates on its troops and freight carried by the roads. No one doubts that the transcontinental railroad cost far more to build than was necessary, nor that considerable skimming off the contracts and the work took place. However, in the context of the era the completion of the railroad remains a remarkable achievement, one that for better or worse changed the destiny and character of the West. Maury Klein, Professor Emeritus of History at the University of Rhode Island, is the author of seventeen books focusing on the industrialization of America. His books on railroads include a three-volume history of the Union Pacific from 1862 to the present and Unfinished Business: Railroads and American Life. His most recent work is A Call to Arms: Mobilizing America for World War II.